Men Having Babies (MHB), a USA headquartered nonprofit organization with members both in the USA and Europe, presented at its September conference a new Ethical Framework for Surrogacy that has already been endorsed by several LGBT organizations worldwide. The conference attracted more than 220 prospective parents from 12 countries and prompted a wide public discourse on surrogacy in Belgium and Italy. Watch the highlight video from the conference. You may view the entire program on the conference’s YouTube channel. 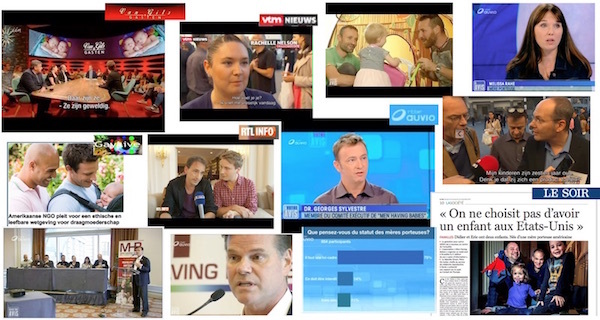 More than 220 attendees from 12 countries attended on September 24-25 the 2016 MHB Brussels conference on Parenting Options for European Gay Men. Representatives of seven European LGBT associations expressed frustration over the currently limited fatherhood options gay Europeans have, and joined MHB in calling for ethical and effective European surrogacy parenting options. The call was informed by ethical parameters for the use of surrogacy that were developed by MHB in collaboration with an advisory committee of surrogates, two of whom took part in the conference. Nine partnering organizations in the USA, Europe and Israel have already endorsed these parameters or adopted very similar positions, including the organizations represented at the conference. The conference was widely covered by the Belgian media over five days, and for the most part MHB’s positions were thoroughly presented. MHB’s board members, surrogates, parents and representatives from partnering organizations were interviewed and featured in numerous news and TV reports, talk shows and debates. Indeed, in a 30-minute prime time TV debate, MHB’s board member Dr. Georges Sylvestre and surrogate mother Melissa Rahe found themselves alongside two Belgian politicians in a 4 to 1 majority advocating for legalizing surrogacy against a sole conservative representative. An online poll showed 75% of viewers supporting this position. In 2016, closer international cooperation and a proactive media outreach resulted in a much more balanced and respectful media coverage. “We all felt that this time the press allowed us to effectively counter those of opposition who tend to make the most inflammatory arguments in order to create confusion and false judgment about surrogacy,” said Anthony Brown, MHB’s board chairman. In one instance, two of MHB’s board members, accompanied by surrogate mother Rachelle and the Italian couple who she assisted (and their twins), walked into the middle of the counter protesters and started a dialogue. This did not only surprise them and expose the inaccuracy and crassness of their message, but also prevented the media from producing a one-sided and biased report (see full story and clip here). The involvement of organizations and individuals from across the continent ensured that the impact of the conference and MHB’s advocacy was felt beyond Belgium and lasted long after the conference was over. A prime example is the four Italian organizations that issued a joint call for surrogacy legislation in Italy based on the parameters of the “international coalition for surrogacy ethics that was born in Brussels.” The four include Famiglie Arcobaleno (Italy’s LGBT parenting association), Associazione Luca Coscioni, Associazione Radicale Certi Diritti, and UAAR. Marilena Grassadonia, president of Famiglie Arcobaleno, explained that her organization joined the initiative because “our ethical charter calls for surrogacy arrangements that are respectful of everyone involved. We always strive to make known that surrogacy can be a path of love, as many stories of our families demonstrate. The international coalition for surrogacy ethics is the best answer to those who condemn surrogacy out of ignorance. Self-determination of the woman remains paramount for us, and we reiterate that lack of regulation or prohibition of surrogacy can only fuel the phenomena of exploitation, not prevent it” (see full report here). This was MHB’s second Brussels Conference and it once again provided a wealth of unbiased information and access to a wide range of relevant service providers. It was offered in an expanded two-days format, and at a larger venue, yet once again an overflow room with live video feed had to be added to accommodate the large demand. It brought together community activists from several LGBT European organizations, medical and legal experts, parents and surrogate mothers. Attendees also learned about finding and choosing professionals to help in the process, and about financial assistance through MHB’s Gay Parenting Assistance Program (GPAP). Annually, GPAP provides prospective fathers who cannot afford the expenses involved with becoming parents with over a million dollars worth of cash grants, discounts and free services donated by more than fifty leading service providers. Read the pre-conference press release with more details about the joint ethical position.